I began rebranding the company in 1997 by producing the Venture Across America/Canada (modern series). For over 15 years from 1997 to 2013 I have created a widely recognized educational campaign. My illustrations have displayed great attention to research, accuracy and insight into the concepts of each graphic. In 2013 the program was "retired", I no longer work or represent the company and moved on to bigger and better ventures. The "SuperGraphics" deal with obscure subject matters less known nationally and internationally, yet played an important role in the local area where it was based. I was the "Art Team", I was the central core of it's making: I researched and worked directly with the scientists and universities for facts, gathering field notes, photos, arranging photoshoots, selecting models, created conceptual drafts, designs, illustrations, and checked quality control for the final printing process. Once the research and final graphic was complete for each State and Province, Public Relations, Web and The Social Media Department helped market the final product. The process starts by gathering information, working through published reports and communicating directly with leading scientists in each field. After I have obtained all the facts and material, I create rough concepts and ideas that are drafted and presented to the CEO. The final art is sent out for production, once it is approved by the CEO. The illustration style of the graphics has been dictated by the limitations of the printing process, the changes in the graphics are noticeable over the years as the technology of the industry has changed. In the past the graphics have been created as spot colors for silk screening but the last ten graphics ( #130 - #139 ) were printed digitally on a Durst plotter before the program was retired in 2013. I have had many people request the whereabouts of a little character I have been hiding in the graphics. The character is known as "Sammy U". The first four graphics I designed (Kansas, Nevada, New Mexico, and California) do not have the little guy incorporated in it. It wasn't until the fifth graphic (Arizona) that the character appeared in the artwork. While researching reference I stumbled across a logo stamped in a computer microchip under a microscope. I decided to incorporate the mascot in the graphic and it became a "must have" in every graphic. At the time, my six year old daughter Samantha would tell me where to hide "Sammy U" for each graphic. She has been hiding them for me through the entire series, until she was 23. I have taken the graphic program to heights never before reached with over the top vector illustrations and highly detailed scientific facts. The series became a highly recognized educational program by teachers, universities, scientists, historians and major art institutes. Among my recognitions as a well seasoned illustrator and designer for the "Supergraphics", I have been highlighted in the "Adobe Illustrator CS6 WOW Book". Techniques from top illustrator artists. A guest on the morning talk show: "Seeing The Need" with –Phil McILveen. 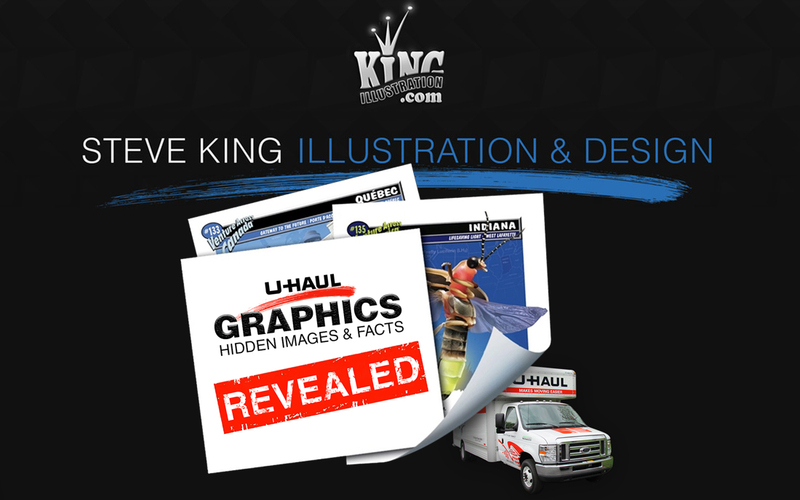 A full spread informative story how I created the graphics for U-Haul in The Charlotte Observer: how drive-by trivia come to pass. Not to mention every graphic I created has been highlighted in the local papers.